A common activity in high school biology is to observe cheek cells. To do this, one takes a flat toothpick and gently scrapes the inside of their cheek. They smear the specimen on a flat microscope slide and cover it with a cover slip. 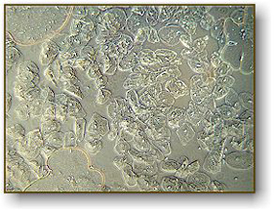 The cheek cells are epithelial cells and will be seen in large numbers. If you add a drop of iodine to the sample, the nuclei of the cells will become more visible. They will appear as small round dots inside the cell. In the picture on the left, we see the cells as they would appear without iodine with a regular microscope. At the right, you see the same specimen using a phase contrast microscope (actually, we used the same microscope with different lenses). This clearly shows that, for some specimens, phase contrast will greatly improve your image quality. Image above with regular brightfield objectives. Notice the air bubbles at three locations, some cells are visible on the left. Same image with phase contrast objectives. White dots inside each cell are the nuclei. 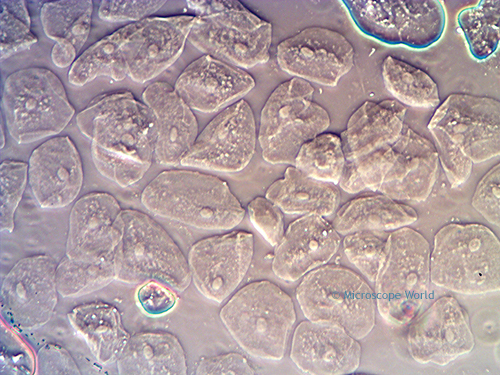 The image of cheek cells above was captured using a phase contrast microscope at 100x magnification. 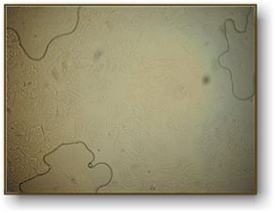 The image was captured with a USB microscope camera. The air bubbles in the above image are highlighted in blue. Phase contrast is a method developed in the early 20th century by Frits Zernike. Zernike discovered that if you can speed up the direct light path, you can cause destructive interference patterns in the viewed image. These patterns create details in the image to appear darker against a light background. 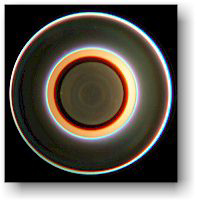 To cause these interference patterns, Zernike developed a system of rings located both in the objective lens and in the condenser system. When aligned properly, light waves emitted from the illuminator arrive at your eye 1/2 wavelength out of phase. The image of the specimen then becomes greatly enhanced. Phase is only useful on specimens that do not absorb light (they are called "phase objects") and it is very useful in showing details in certain specimens such as cell parts in protozoans, bacteria, sperm tails and other types of unstained cells. This technique proved to be such an advancement in microscopy that Zernike was awarded the Nobel prize in physics in 1953. You can see the Frits Zernike biography here. How to set up your microscope for phase contrast observation. In order to set up your microscope to view objects with phase contrast you must have phase contrast objective lenses and a phase contrast substage condenser. Shown at the left is the phase contrast kit used with National Optical model 160 series of microscopes. The kit consists of 4 objective lenses, a centering telescope and a Zernike phase condenser lens. The long silver adjustment screws on either side of the condenser lens push in to engage set screws inside the condenser for proper alignment. 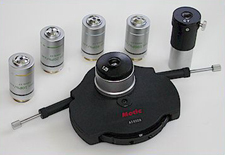 Not all phase contrast microscopes are the same but generally they rely on similar techniques to set up the system for optimum results. In the system shown at the right, the phase condenser has five settings that you can rotate through (10x, 20x, 40x, 100x and BF) BF is "brightfield" with no phase. 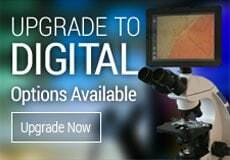 To set up your microscope for phase optics, you first set it at BF and focus on the specimen. Adjust the height of the condenser for optimum image quality. Next, set the condenser turret to the phase setting for that particular lens and remove the specimen. The controls that stick out from both sides on the back are for centering the condenser. Next, you will need to remove one of the eyepiece lenses and insert the centering telescope in its place. 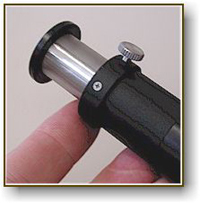 The set screw is used to focus the centering telescope. 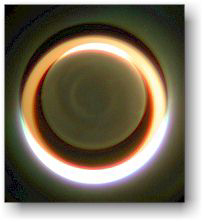 When looking through the telescope, you will see two rings. They may or may not be concentric. By turning the centering adjustment screws on the condenser, you align the rings so that they are concentric (see the images below). Finally, remove the centering telescope and replace the eyepiece lens. Put your specimen back on the stage and you are ready for phase observations. When you change objectives, you should go through this centering procedure again (although you may discover that the alignment remains consistent with all objectives). Above, typically what you might see before alignment. Above, image once aligned and optimized for phase contrast. 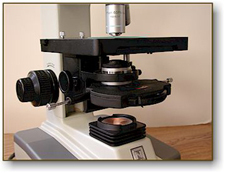 We offer several different microscopes that include phase contrast. They are listed below, with the highest quality found in the Meiji microscope. Motic DMBA310 with built-in digital camera. 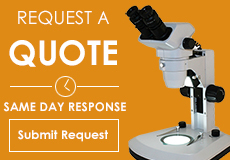 For further information on phase contrast information click here.